This multimedia, multiple character story centers around an aspiring young performer named Petal as she takes on the role of caregiver after her mother’s diagnosis with a mental illness . Petal’s life is abruptly interrupted yet again when her neighborhood becomes gentrified and Petal and her mother have to leave their family home. The circumstances, battles and situations the Petal goes through is a rites of passage to understanding life. 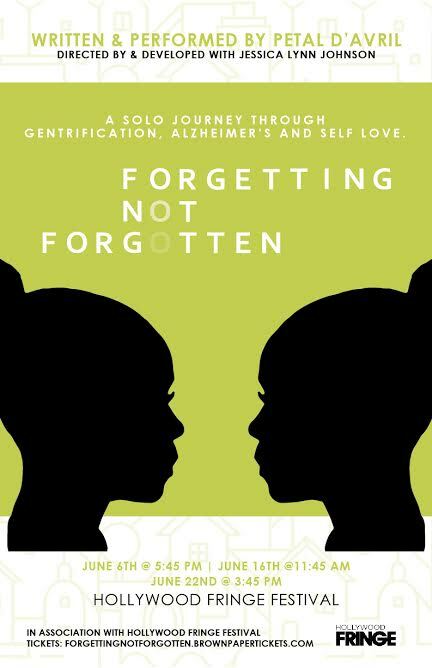 FORGETTING NOT FORGOTTEN at Hollywood Fringe!! WILLY’S LIL VIRGIN QUEEN at the Santa Monica Playhouse BENEFIT SERIES!